At the Grant Museum both staff and our visitors are very lucky because we do not have quite the same level of red tape as most non-university based museums. Our collections are historically for teaching only, and even now are still used heavily in undergraduate courses at UCL, which means that physical access to specimens is much more possible than in non-teaching based collections. It is for this reason, as well as the shining personalities of the Grant Museum staff no doubt, that our Museum is extremely popular with artists. 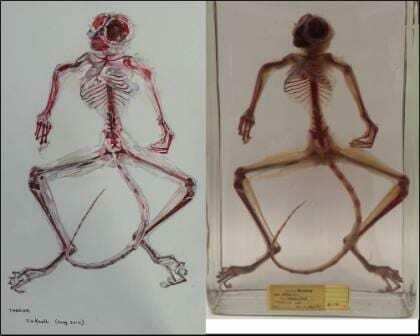 The ability to choose a specimen (within reason… the mounted donkey skeleton is a little heavy) and have it placed on the table in front of you for you to gaze at and draw to your heart’s content, is surely nearing unparalleled levels of excitement. One lady in particular loved our collections so much that she dedicated four afternoons a week for nine years, to drawing in the Museum. She became an official volunteer, greeting visitors and clicking people in. Finished works of her art adorned the front desk in the new building* whilst she sat nonchalantly beside them, working on her current piece. These works both attracted admirers and inspired other artists and she was well known by regular visitors to the Museum. Her name was Janet Knell and she was both a good friend and an integral member of Team Grant. I’m using the passed tense because tragically, she passed away last July. Her Grant Museum paintings and drawings however remained with us. Over the last few months a number of members of the public have asked after Janet and I have enjoyed getting out her portfolios and sharing her works with them. They are always greeted with ooh and aahs of delight and I love talking with people about Janet and the love she had for the collections, which comes out in both the detail and the volume of her work. It was Janet’s birthday recently and as I am unable to give her any presents, I thought perhaps you would like a present from us to celebrate her birthday instead. So I went through her portfolios and selected my personal favourites in her collection to share with you. 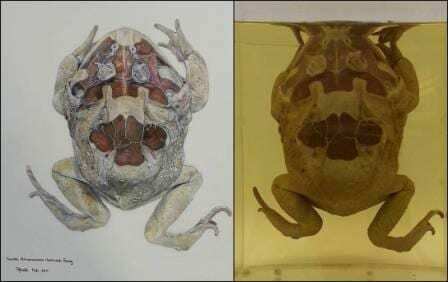 To the right of each image is the specimen itself so that you can, as we all do here, appreciate the skills that she had and the obvious passion for both art and natural history that is brought out in each piece. 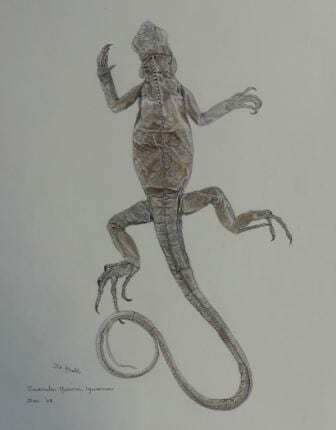 If you create any drawings or other art based on specimens in the Museum, we have a special Tumblr page dedicated to you. If you would like to, you can upload images of your art and share it with us and the Grant Museum’s audience: www.grantmuseum.tumblr.com. Remember, you don’t have to be an artist, all ages and talents are welcome! 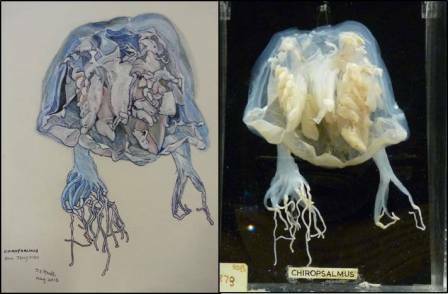 Her drawings capture the life of the specimens so much better than photos. I remember chatting to her over several days as she worked on that astonishing magpie painting. She had a rare talent. If it’s the same Janet Knell (North London? ), I’m very sad to discover that she has passed on. She was my late mother’s cousin and we all used to meet every Christmas. Janet loved animals and used to work with Gerald Durrell. Much missed.